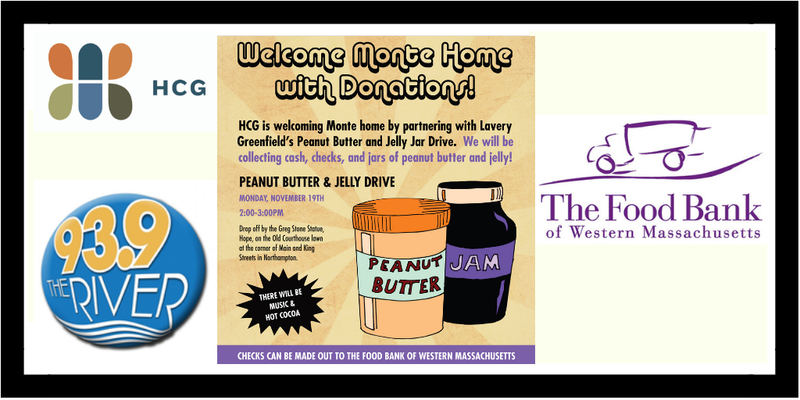 HCG is once again welcoming home Monte’s March by partnering with Lavery Greenfield’s Peanut Butter and Jelly Jar Drive. We invite you to join with us in support the Food Bank of Western Massachusetts. On Monday, November 19th, from 2:30-3:30 pm, we will be gathering on the lawn of the Old Courthouse to welcome Monte home with donations of jars of peanut butter and jelly, cash, or checks for the Food Bank. Donations will be accepted on the side lawn by the late Gregory Stone’s statue ‘Hope’, at the corner of Main and King Streets in Northampton. Lavery Greenfield’s generosity to giving back to her community by starting the Peanut Butter and Jelly Jar Drive was an inspiration for the ‘Hope’ statue. 1. Simply download this flyer: Monte_PBJ_Flyer_PRESS_8.5x11_2018, and put it on a box to collect donations at your business. 2. Bring the donations to HCG at 99 Main Street on or before November 19th. 3. Join us at the event on Monday November 19th to welcome Monte home with your donations. 4. Let us know you are participating and we will share your values on social media. *If you want to participate and are unable to bring your donations to us, please let us know, and we will pick up any donations you have. **Checks can be made out to The Food Bank of Western Massachusetts. In the notes section, please mark checks as PB&J. On November 19th and 20th The River’s Monte Belmonte will be leading his annual march against hunger through the Pioneer Valley. For two days, Monte, Congressman Jim McGovern and a number of supporters will push a shopping cart 43 miles from Springfield to Greenfield to raise awareness and funds for food insecurity in our region. HCG encourages all area businesses and interested community members to gather on the lawn and bring donations for the Food Bank. Please come and join us in supporting this worthwhile cause to help ensure that all families have enough to eat. We applauds the community-minded efforts of Monte and Lavery and all those who give.